Check back here for the scoop on the latest news, anecdotes and previews from yours truly. Okay. Okay. I get it. It's been awhile. And I said that wouldn't happen anymore. But I promise it's all been for a good reason, and that reason is... SUMMER OF 84 HAS THE GREENLIGHT AND WILL BE FILMING THIS SUMMER!! AND THE HARROWING HAS BEEN PURCHASED AND SHOULD GO INTO PRODUCTION THIS YEAR! Yeah, and guess what? This is NOT an April Fool's post, I promise. Keep checking back in the next few weeks and I'll give you updates on these two projects as they push toward principal photography. In the meantime, you can head over to Summer of 84's page on Facebook and hit us with a Like so you can get official updates from the production team and the directors, Roadkill Superstars (Turbo Kid)! Just click HERE. Also, back in October, Matt and I made it onto a string of lists for 2016. SUMMER OF 84 was on the 2016 BLOOD LIST (click here) of the best unproduced genre scripts, THE HARROWING was on the 2016 HIT LIST (click here) of best unproduced scripts, and Matt and I were honored to be listed on the 2016 YOUNG AND HUNGRY LIST (click here) of the top 100 new writers in Hollywood. What a huge year for us, and we're looking to 2017 to keep the momentum going. To see any of the three lists, click the links in the text block above the image. See? Kept my promise not to go dark for as long as the last time. Just a quick update today because I have a bigger announcement coming soon (check back in the next couple weeks!). For today, I wanted to let everyone know that Matt and I have a new script on the market titled The Harrowing (formerly The Offering). You can find it listed in the dropdown at the top of the page, but unfortunately, it's not available for me to share because... I'm happy to report that Creative Artists Agency (CAA) is representing it along with our manager, Jeff Portnoy of Bellevue Productions! This is huge guys. Fingers crossed that we get a big response to this one. There are a few other pieces of news that are developing, so more to come on those soon. I'm heading to L.A. again in a week to take a handful of meetings and pitch some projects, so send me good vibes, and I'll report back anything exciting. December and January saw two trips to L.A. for meetings at over a dozen production companies and studios where Matt and I met a big group of awesome creative executives who were fans of MR. USA. Door's still open on making that one. Matt and I blasted through a new script in March/April, a thriller called SUMMER OF '84. As we speak, we have an amazing directing team attached and we're in the process of shopping the script around trying to find a great production company to come on board. You won't find that one up in the SCREENPLAYS tab yet due to confidentiality, but it should pop in there soon, so keep your eyes peeled. Thanks to SUMMER OF '84, I now have an official IMDb page! Can you believe I'm "Stephen J. Smith (II)"? Unbelievable. There's not much to see there, but if you want to check it out, HERE it is! Hoping that page will blow up within the year. Matt and I just finished yet another new script, THE OFFERING, which IS in the SCREENPLAYS tab but isn't available to request for reading yet. We'll be polishing it up over the next month, and then we'll see from there. More to come on that one as it progresses. Matt and I are deep into development on two new concepts, one of which we have a full outline ready to go, and the other we're nearly there. They're a big, sweeping adventure story and a big, blockbuster action-comedy respectively. Really looking forward to digging into the scripts for each one. When there's news to share, I'll be back here letting you all know. Since the release of X-MEN: APOCALYPSE (Twentieth Century Fox) in theaters a few weeks back, I've had a massive number of requests for the PDF of my version of a cinematic Apocalypse story, which you can find right HERE. It may be just for fun, but if you like the X-Men and want to check it out, hit the PDF Request button over on that page. Give it a read and let me know how you think my version stacks up against the official film right here on my FACEBOOK PAGE. Requests for the sequel to THE SABRAEL CONFESSION keep pouring in. Thank you all for such incredible support! I promise the sequel is coming, it's just slow going with all the screenplays being written. But stick with me! Stay strong! I can't wait to get that story out of my head and onto the page, believe me. I know you're all going to love the next volume of THE HEAVENLY WAR CHRONICLES. Don't have your copy of SABRAEL yet? Never fear, grab one HERE! I also haven't forgotten about getting some short stories posted on the site. I'm still learning the ins and outs of Squarespace, and I haven't found a good way to present them for you yet with embedded pages or something. As soon as I figure it out, I'll put up a bunch for you. Until then, here's a six word story for ya: "Floating. Always up. Never down. HELP!" That covers the basics of everything that's been going on so far in 2016. On a separate note, if you have read THE SABRAEL CONFESSION and haven't left a review on Amazon for the book, please, please, pretty please take a couple minutes and post one now. Reviews help the book show up in the "Recommended For You" lists when people buy similar books, so just taking a minute to rate it and write a quick little line about what you thought will allow hundreds of new readers to find the book. Thank you so much, everyone! Keep checking back for new updates. Things are heating up! The rest of this year is looking to be pretty exciting! My comedy spec script "MR. USA," written with Matt Leslie, landed a spot on the 2015 HIT LIST! For those who don't know, the Hit List is a list of the best spec scripts of the year as voted on by movie industry professionals, so this is a HUGE accomplishment. We placed at number 48 out of 91 scripts on the list, out of the 10,000+ scripts written and registered this year. Very honored to have made the cut! The cover is really well done. It’s eye catching, and it gives us the fantasy, supernatural theme right up front. The back cover copy is great, but the font is a bit small and hard to read. The interior is nicely laid out. The prologue and introduction do exactly what they are supposed to do, but so few get this right. You start this story off with a bang. The plot is unusual and creative. You discuss things we all wonder about so we will keep reading to see what happens, to see how these things are handled in the world you’ve created. You do a great job of filtering the other world information into the plot, keeping the story moving. Good chapter hooks. We like Sabrael immediately because even though we come to understand he is an angel, he starts out referencing the TV, the weather, and spiral notebooks. Things we can relate to. He’s stranded, yet he’s an angel. That perplexity makes him more human-like and likeable. This continues when we see him in heaven and how he is different there and how Lucifer tries to use that against him. We as readers resonate with that. The voice, despite writing about supernatural and amazing things, is remarkably down to earth. Sabrael relates the wonders of heaven with the amazed delight of a child and we experience the wonder with him. The voice could easily slip into being lofty or pedantic, but it doesn’t. The emotion that flows through the voice in this writing is what keeps readers looking to the same author over and over again for a good read. This is a wonderfully creative work that reflects a master storyteller. I'm obviously bummed I didn't take home the Grand Prize, but that's high praise from Writer's Digest. I'll take it. Secondly, as all you novelists out there already know, it's officially National Novel Writing Month (that's what that weird "NaNoWriMo" thing means, in case you hear people throwing it around)! I'm tackling Sleepwalkers head-on this year. I spent some time last night reading through everything I've previously written for the manuscript to give myself a fresh perspective. Now it's off to the races. Keep track of my pain and progress on Twitter at @thewriteSJSmith, and hopefully we'll be here together in 28 days celebrating the first completed draft! Another month of revisions on MR. USA ended up with a fantastic draft (if I might say so). Never had such a grueling experience developing a project, but it was well worth the pain. Send good vibes this way; it's being read by some big names as we speak! Having technical difficulties with the short story page. Sorry for the delay. I've been toying with different options to make the reading experience better for everyone. Hopefully up and running soon! Big news today! Matt and I finished our new draft of MR. USA and delivered it to our manager. For those keeping score, we were so entrenched in the script for all of August that we were sleeping 4 hours a night and working on the phone for 6 hours a night...nearly every night. Who's ready for some sleep? Even better news: Check back in the next week or so and I'll have some new short story goodness available for you to read. Swing over to my short story page here to check it out. Been out of contact for a bit working on some new material. Looking forward to sharing with everyone once it's a little farther down the road. For now, the two Food Network TV spots I wrote and concepted for the Camp Cutthroat series are playing now on Food Network! Feast your eyes below. Bon appétit! Update on The Sabrael Confession: It's been bouncing up and down the charts on a daily basis, which is great. Today it reached its highest bestseller rank since the book launched 6 weeks ago...and it's still in the Top 100 for Christian Fantasy! It's also maintaining its perfect 5-star rating as more reviews are coming in! Big thanks to everyone contributing to the cause, writing reviews and getting the word out. Let's keep it going! THE SABRAEL CONFESSION received an amazing 5-star review from the good people at Readers' Favorite Book Reviews! Click HERE to read the full review. Are you a Goodreads user? Want a free copy of THE SABRAEL CONFESSION... for free? Enter the book giveaway by clicking below! Good luck! Giveaway ends July 04, 2015. I'm working on dedicated sites for THE SABRAEL CONFESSION and the expanded THE HEAVENLY WAR CHRONICLES universe. If you have suggestions for what you'd like to see on those sites, hit me with ideas on the Bio/Contact page. THE SABRAEL CONFESSION is holding strong with a 5-star Rating on Amazon! Thanks to everyone who's rated it so far! 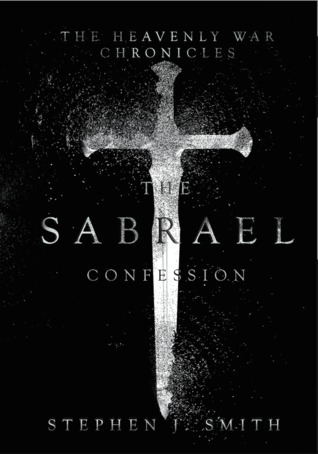 THE SABRAEL CONFESSION is now available on Kindle! Head to Amazon to get it now! THE SABRAEL CONFESSION conversion to Kindle is nearly complete! Check the Amazon listing in the next day or so to get your ultra-mobile digital copy (for those rare times when you forgot your print edition at home). HUGE news today, kids. I'm pleased to announce that my partner in (screenwriting) crime, Matt Leslie, and I are now repped by Jeff Portnoy of Heretic Literary Management! Looking forward to an epic partnership. THE SABRAEL CONFESSION is holding strong as the #1 New Release in Christian Fantasy on Amazon! THE SABRAEL CONFESSION is the #1 New Release in Christian Fantasy on Amazon! Huge thank you to everyone who bought the book today and made it an instant sensation! THE SABRAEL CONFESSION is here! Print edition now available on Amazon! Click the title to buy now, or if you're a Kindle fan, check back on May 26 for the digital edition! Physical proofs of THE SABRAEL CONFESSION are underway. Shouldn't be long now, kids. THE SABRAEL CONFESSION is in the proof stage. Working hard to get it published and released! THE SABRAEL CONFESSION is in production! Only a few weeks left until Sabrael unleashes his story on the world. Who's ready? ?